On March 8, 2018, LSU Museum of Art will exhibit the work of Robert Williams. 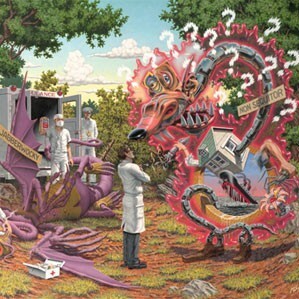 Robert Williams’ epic cartoon-inspired history paintings draw from American vernacular and its visual slang. Relying on concrete, relatable, and often absurd imagery to invoke social commentary, Williams work continues to confront and confound. In the 1960s, Williams began creating work that channeled the shifting energies and immediacy of counterculture. His paintings rejected the prevailing dominance of conceptual minimalism, focusing instead on a return to craftsmanship, figuration and popular imagery. In 1979, Williams coined the term “low brow” as a way to articulate his opposition to an establishment “high” art world from which he was excluded. For better or worse, “low brow” became the namesake of the fledgling New Contemporary movement, which Williams was instrumental in fostering. Robert Williams: Slang Aesthetics is presented courtesy of the Artist, Thinkspace Gallery, and curator Josef Zimmerman and will be on view at the LSU Museum of Art March 8 through June 17, 2018. March 8, 2018, 6–8:30 p.m.
March 11, 2018, 6–8:30 p.m.
Manship Theatre will screen the documentary Robert Williams: Mr. Bitchin’ in conjunction with Slang Aesthetics. Mr. Bitchin’ delivers insight into multiple American counter-cultures by following the great American artist and underground legend Robert Williams. From Hot Rods to Punk and Metal, from LSD to the top of the art world, the influential paintings of Robert Williams defied categorization until they became their own art movement. Museum admission before the film is included in the ticket price. $8.50 for general public, $7 for LSU MOA members. March 15, 2018, 6–8 p.m.
April 4, 2017, 12–1 p.m.
LSU art history professor Joe Givens will discuss morality in the work of Robert Williams and William Hogarth, whose moralizing print series from LSU Museum of Art’s Permanent Collection are on display in conjunction with Robert Williams: Slang Aesthetics. Free to attend.